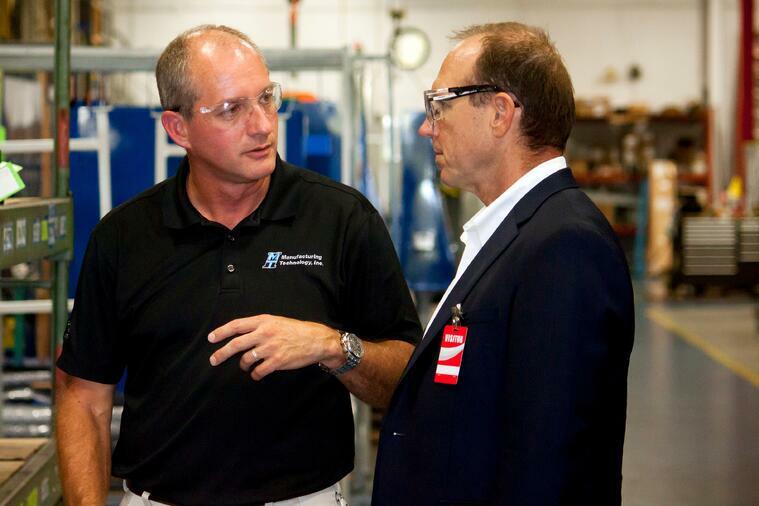 SOUTH BEND, IN - September 16, 2016: Manufacturing Technology, Inc. (MTI) reconnected with leadership guru and award-winning author David Marquet. During an Executive Forums Leadership Summit attended by MTI and other organizations, Marquet demonstrated the importance of leading with intent. Marquet believes the ideal workplace is one where everyone participates and contributes their full intellectual capacity. MTI, who has established itself as a leader in friction and resistance welding, including Rotary Friction, Linear Friction, and Friction Stir Welding technologies, previously identified opportunities to elevate the business by integrating Marquet’s leadership techniques with its existing culture of INGENUITY (Innovative, Genuine, Continuity). Working with MTI employees and others at the conference, Marquet described the necessary steps to implement a leadership process where control is given to employees at all levels. In a small breakout session, MTI employees worked through scenarios and discussed how to best handle specific leadership dilemmas. As stated in his bio, Captain Marquet is a 1981 U.S. Naval Academy graduate and served in the U.S. submarine force for 28 years. After being assigned to command the nuclear powered submarine USS Santa Fe—then ranked last in retention and operational standing—he realized the traditional leadership approach of “take control, give orders,” wouldn’t work. He “turned the ship around” by treating the crew as leaders, not followers, and giving control, not taking control. This approach took the Santa Fe from “worst to first,” achieving the highest retention and operational standings in the navy. After Captain Marquet’s departure, the Santa Fe continued to win awards and promoted a disproportionate number of officers and enlisted men to leadership positions, including ten subsequent submarine captains. Stephen R. Covey said it was the most empowering organization he’d ever seen and wrote about Captain Marquet’s leadership practices in his book, The 8th Habit. Following Marquet’s lead, MTI will continue encouraging leaders at all levels of the organization.